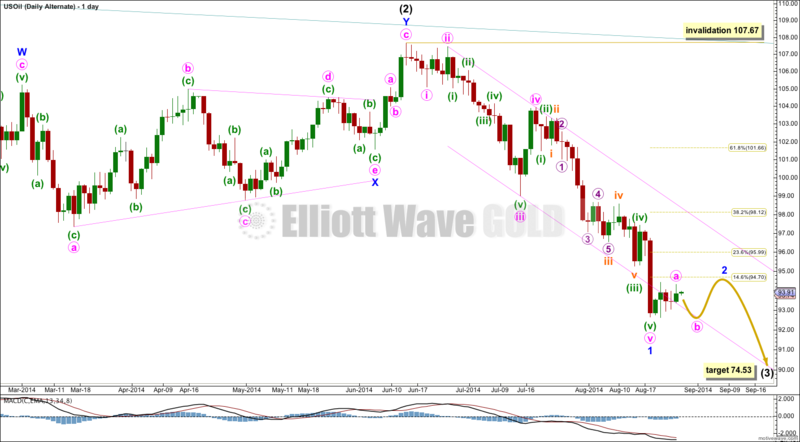 Price continued lower, but this is not what was expected from last Elliott wave analysis. I had expected to see a second wave correction. Summary: The target remains at 74.53. This target may be 13 weeks away. The structure of minor wave 1 looks to be most likely incomplete. Currently, I expect a small fourth wave correction may have just completed as a double combination. At 85.88 minuette wave (v) would reach equality in length with minuette wave (i). Thereafter, minute wave iv should move price higher and sideways for a few days, and be followed by more downwards movement. Overall I expect it is now most likely that minor wave 1 will continue lower for another couple of weeks or so. Within minute wave iii minuette wave (iv) may not move into minuette wave (i) price territory above 99.01. I have drawn a channel about minute wave iii using Elliott’s first technique: draw the first trend line from the lows of minuette waves (i) to (iii), then place a parallel copy on the high of minuette wave (ii). If this channel is breached by upwards movement then I would expect minute wave iv is underway. However, it is also possible that upwards movement may not breach this channel. 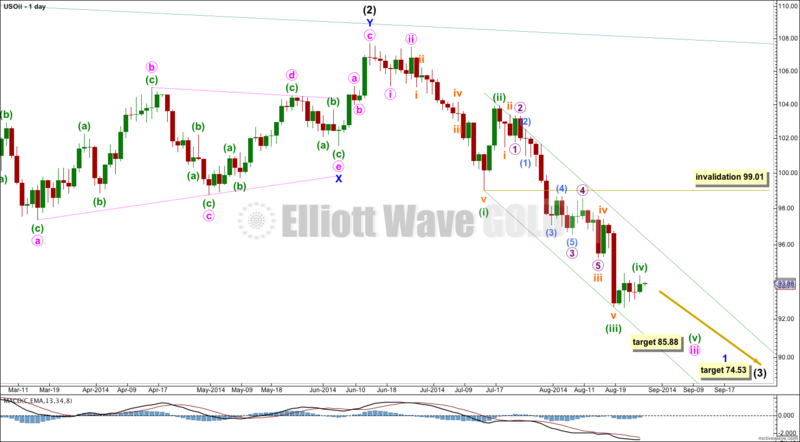 The target for intermediate wave (3) remains at 74.53 where it would reach 1.618 the length of intermediate wave (1). Intermediate wave (1) lasted 13 weeks and intermediate wave (2) lasted 28 weeks. I would expect intermediate wave (3) may last a Fibonacci 21 weeks. So far it is in its 8th week and may continue for another 13 weeks. It is possible that minor wave 1 is over with an extended fifth wave. If minor wave 2 has begun then it is unfolding as a shallow flat correction, with minute wave a within it as a complete double combination. This alternate would expect a very shallow second wave correction. This is entirely possible, but it is unusual. This reduces the probability of this wave count to an alternate. Within minor wave 2 minute wave a is complete. Minute wave b must reach a minimum 90% the length of minute wave a so must move to 92.81 or below. Thereafter, minute wave c should move to a new high above the end of minute wave a at 94.33 to avoid a truncation. This alternate wave count would see minor wave 2 as very brief, and unlikely to breach the channel containing minor wave 1. This is unlikely and further reduces the probability of this alternate wave count. Minor wave 2 may not move beyond the start of minor wave 1 at 107.67. Are we going to correct up for a few more days? I ask myself why would oil drop 20-25% in a few months, seems not reasonable but…..look at political situation. Currently US is trying to punish Russia over Ukraine with economic sanctions. Energy / oil is backbone of Russia economy. Low price of world oil is a big economic problem for Russia. US and NATO use oil market to punish Russia, send a message. Probably a rebound in oil price this winter when Europe needs fuel. Does this fit oil EW chart? Just a thought, of course I do not know. That’s a fundamental analysis approach, which is mutually exclusive to EW. EW theory is that it is social mood, as expressed in market movements, which causes the news and causes things like war, economic sanctions and the like. Lara, I would appreciate your comments on the probability of this count at the intermediate level. Would you say 50, 60, 70, 80, 90% oil hits 74 in about 13 weeks? I would say 70 – 80% likely. Because (1) down is such a good impulse, and (2) up is so clearly corrective.